This thread will chronicle my pastramă journey, using a venison roast from deer that we have hunted. Most of the information provided was from actual Romanians, so it is certainly worth reading. therefore, there will be some crossover, and concepts that work well there will similarly be effective here. Here are some pictures showing a breakdown of muscle groups etc from the hind quarter of a deer. The pictures were lifted from another forum and those of you looking for information on butchering deer can find quite a bit of great material there; the method shown is very close to what we do with our own deer. My recipe and method will most likely be an amalgam of what I have learned in my research on this subject, drawing on both Romanian and Greek techniques. for this first attempt, i'll use Morton's Tenderquick for the curing agent, reserving the more traditional salt cure for another time. 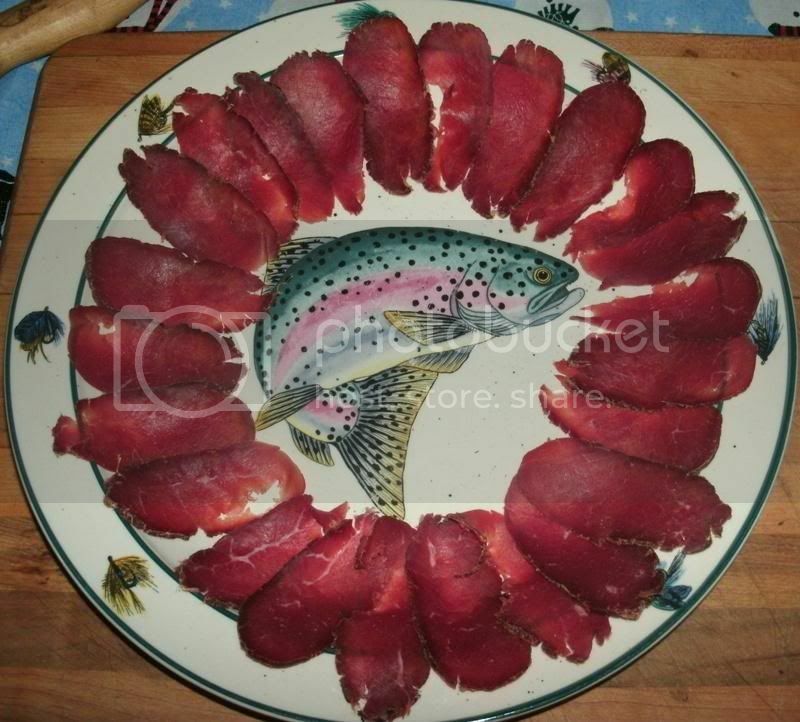 there are only a few minor differences between this project and any involving similar dry-cured meats such as South African biltong or Swiss bündnerfleisch. If anyone has any interest in persuing those projects, this tutorial will hopefully be of some assistance. Please feel free to reply with questions, comments, opinions, suggestions etc. I will do my best to answer them. Now this is exciting...I'll be following your progress closely Tas! 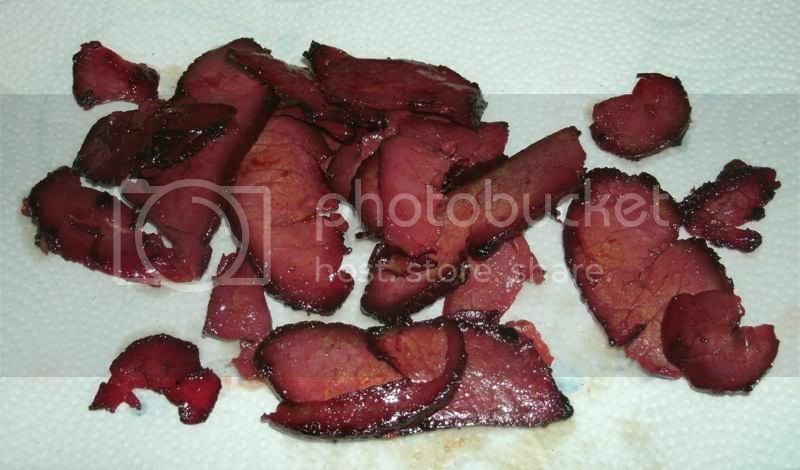 Alright, here's the run-down on project pastramă so far; this is a work-in-progress, so there will be more to come. I always have trouble telling the top and bottom rounds apart, but I am pretty sure that it is the top round. As you can see, it's been trimmed of membranes, silverskin, fat etc. 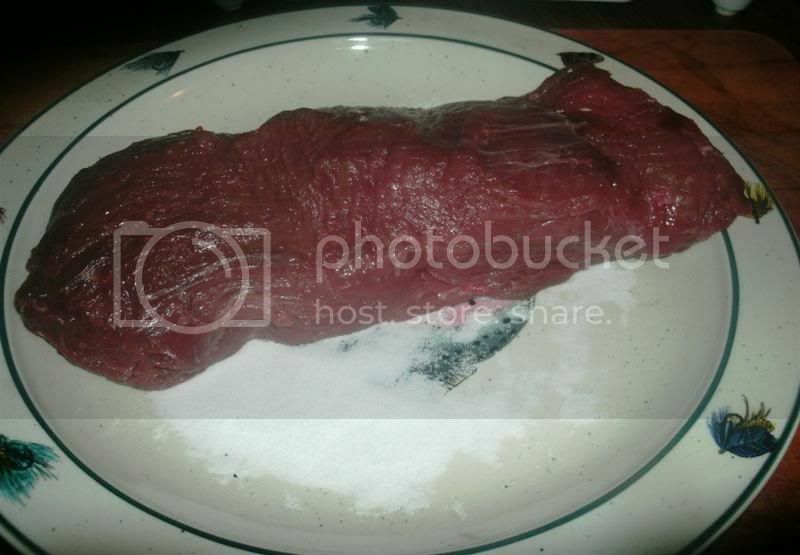 and is a nice, clean, wonderful hunk of good Montana venison - all ready for the project! 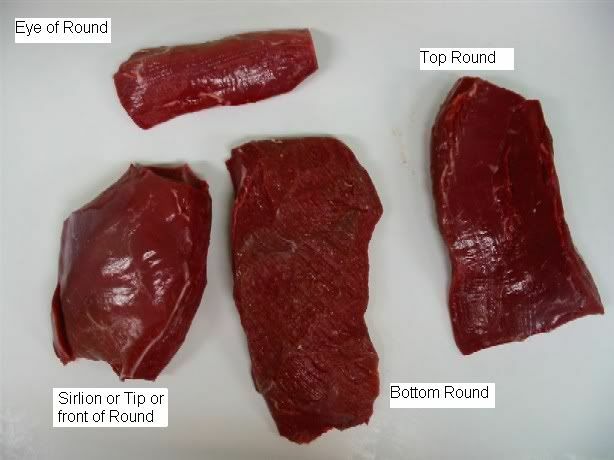 As any hunter knows, the weight of any venison roast varies according to the size of the deer, the amount of trimming necessary and other factors. I had actually bought a digital kitchen scale for this project (the only other one I had went to 1 pound only), but since I had misplaced the batteries (and they were those round, nickel-sized ones that aren't available in small towns on Sunday evenings), I had to guesstimate the weight. 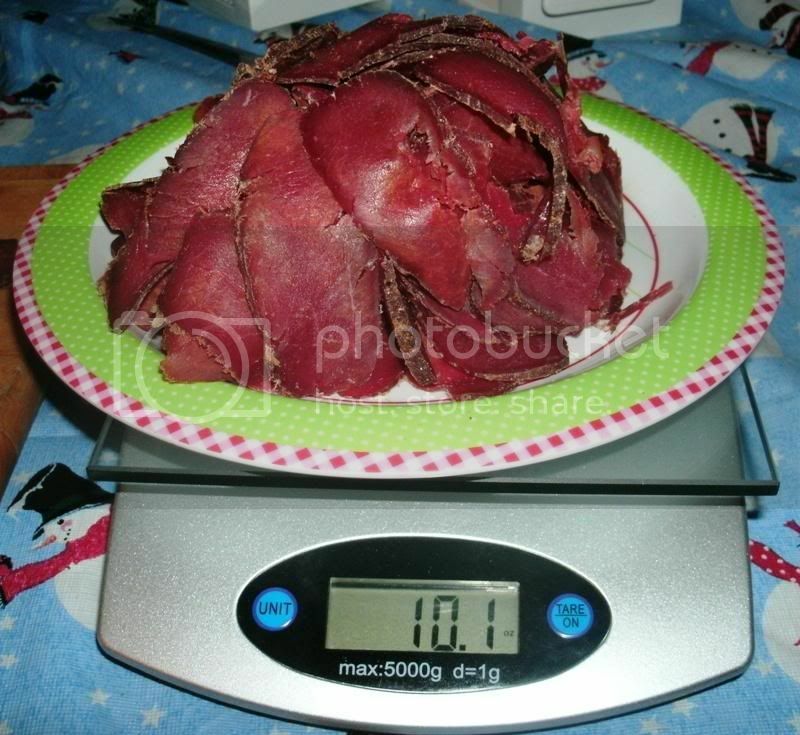 I knew it was more than a pound, but not quite 2 pounds, so all of my measurements (cure, spices etc.) were for a 2-pound roast, in order to be on the safe side of the cure. 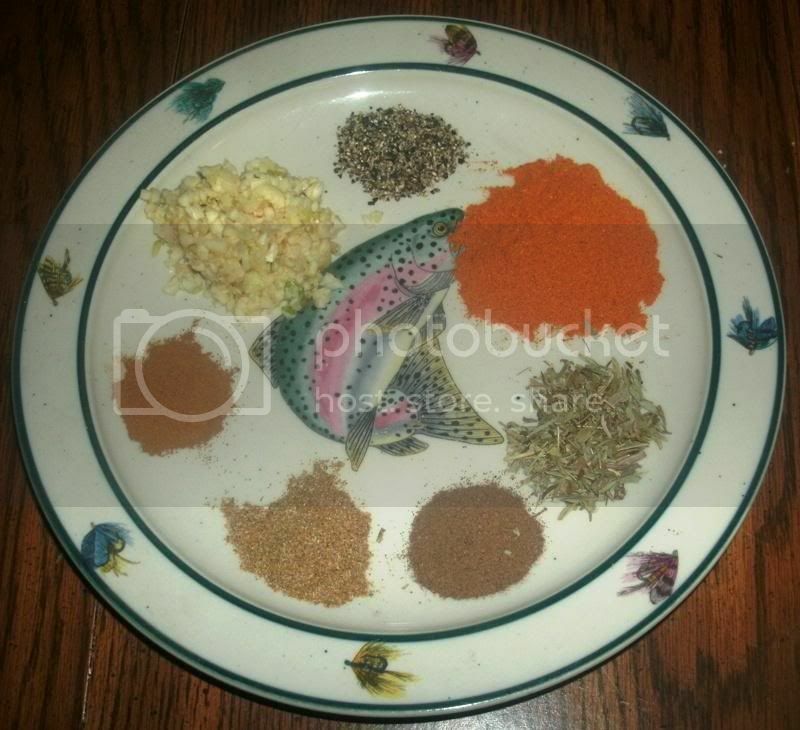 These particular spices, and their amounts, were derived from a summation and extrapolation of my research. My goal was to use spices that were definitely part of traditional Romanian pastramă in amounts that would be consistent with a good balance of flavours. 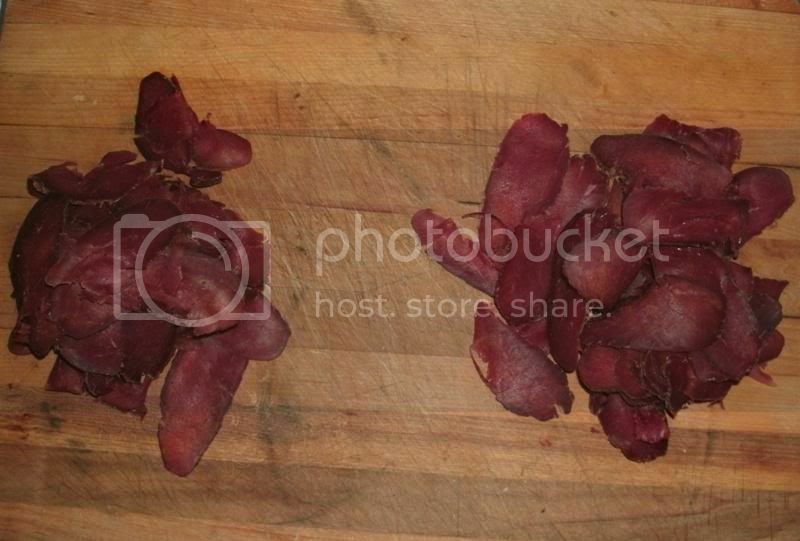 There are other spices that can be used, including (but not limited to) cloves, nutmeg, hot red pepper flakes, cumin and wine; however, these would not be as "traditional" to the ur-pastramă (except for cumin and wine, which I didn't have on hand at the time) as indicated in my research. The end results will tell me if I succeeded, and I can tweak from that point. 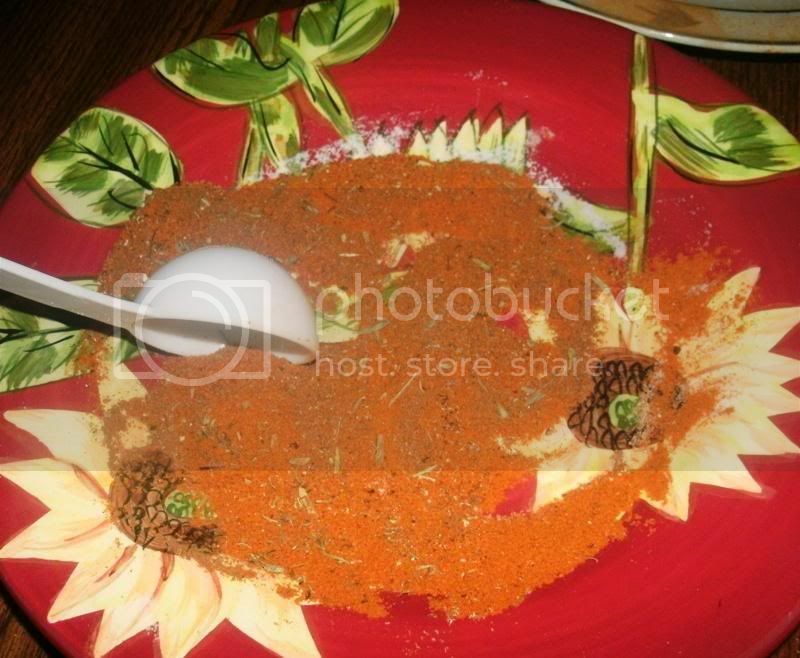 A note on salt: after seeing the amount of Tenderquick involved, I elected not to add any salt for this first attempt, so that the salt would not overwhelm the finished product. I will report on results and add salt to my next preparation, if necessary. a note on sugar: during my research, sugar was mentioned one or two times, but not in the more traditional, Romanian accounts - nor in the traditional, Romanian recipes - therefore, I left sugar out of the seasoning rub this time (except for the small amount in the cure, of course), opting for ingredients that I knew were traditional. 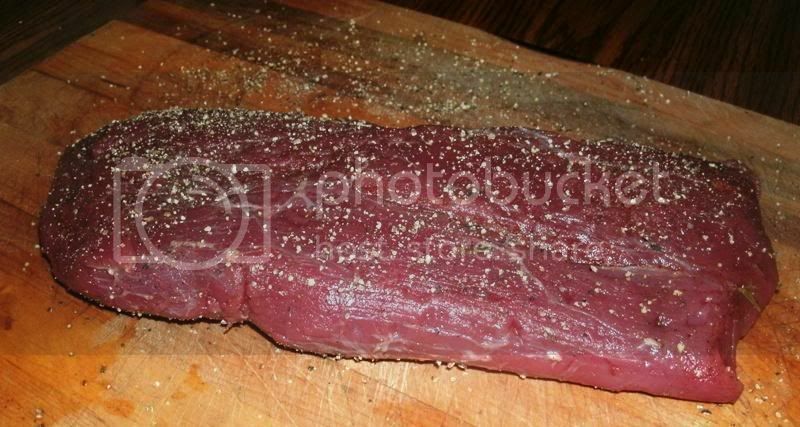 Since I was measuring for 2 pounds of meat, I used 2 tablespoons of Tenderquick, according to package directions for a dry cure. since the roast was in actuality a little less than 2 pounds, the amount of cure was slightly more than recommended; however, it seems to me that it is better to have slightly more than less, as long as you don't go over by a large amount, especially in light of the lack of ability to get an accurate weight for the meat. 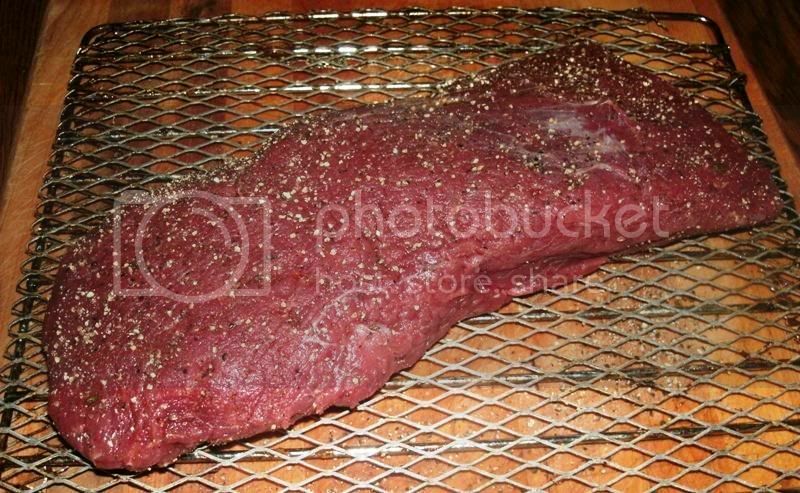 I’ve never cured any large cuts of meat - my curing experience is limited to jerky and ground meat, which use different methods; consequently, I was flying in new territory here and learning as I progressed along. traditionally, pastramă is made with a dry salt cure, but this method is a little advanced for my current skill level in charcuterie; therefore, I elected to use Morton’s Tenderquick cure, and will learn more about salt-only curing for future attempts. On to the execution of this project! then, I applied the remaining Tenderquick on top of the roast, rubbing it in a little and turning it on the plate a couple of times in order to coat evenly. 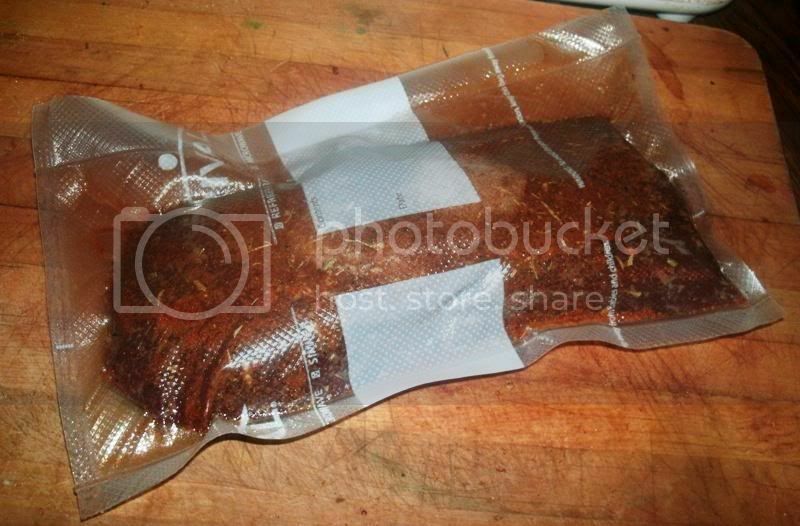 Next, I laid the roast in a vacuum seal bag, then I emptied any "leftover" cure and spices from the plate into the bag as well. Note for future reference: a paper plate might work better, since it can be folded and poured into the bag. The lighter spot you see on the middle of the roast is where I dumped the remaining spice from the plate. So I decided to use it for this curing project as well. 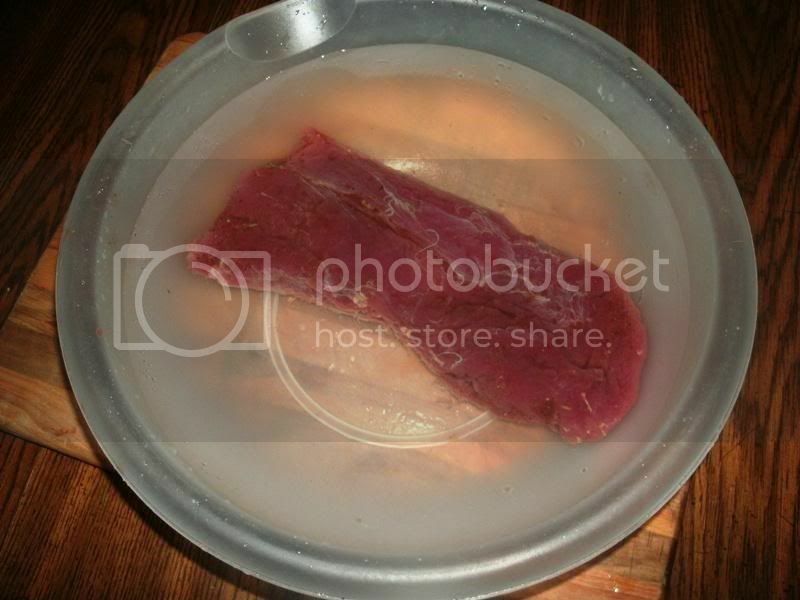 The vacuum seems to help with the absorption and osmosis that take place during brining, and the seal of course prevents any chance of leakage. The total came to 4 days of curing time, but I am adding a little time for safety and - let's face it - to get me to the weekend so that I would actually be able to work on the project. Then, I put the roast in the refrigerator in order to let the cure work its magic. I’ve been turning and massaging the meat once each evening, in order to ensure that the cure is well-distributed. Oh my Ron....this is looking good. I've never used Tenderquick myself...always cure #2 so it interesting to me to watch the procedure. And the spices...savory was a surprise to me. 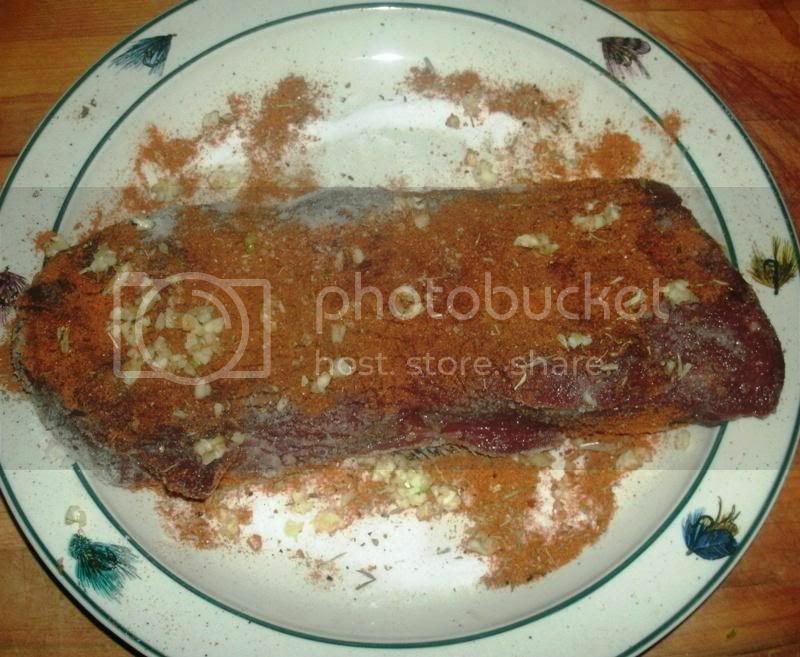 I'm sure it will be delicious, and you certainly are right on with the curing time. Nice photos and tutorial so far as well...I can see this being made into a "sticky" for easy reference in the future. G'morning, Dave, and thanks for the kind words - this is one I have wanted to try for a very long time, and I am excited to be able to do so. Tenderquick is pretty much the only cure I know; I’ve never really seen any of the insta-cures or Prague powders available, but Tenderquick always is. I’m not too cognizant of the differences, but I can say that the Tenderquick is certainly worth a try. In my reading, I found that thyme or savory was traditionally used, and since I had some fresh, dried savory on hand, I figured it would be a nice addition. As a rule, savory is a little milder than thyme, yet similar in taste, so I figured it would be a good way to add an important, traditional flavour element without overwhelming the other herbs and spices in the product. We’ll see if I made a good choice! When we last left you, Dear Reader, we had just put the venison roast and cure into a vacuum-seal bag and into the refrigerator to cure for at least 5 days. As it turned out, I didn't get to continue this project until the evening of the 25th of December, so it was a few more days than that, but no worries - a little bit of margin is just fine! I'm not sure if all of the steps above are necessary, considering the vacuum seal, but as I've said before, it sure didn't hurt. 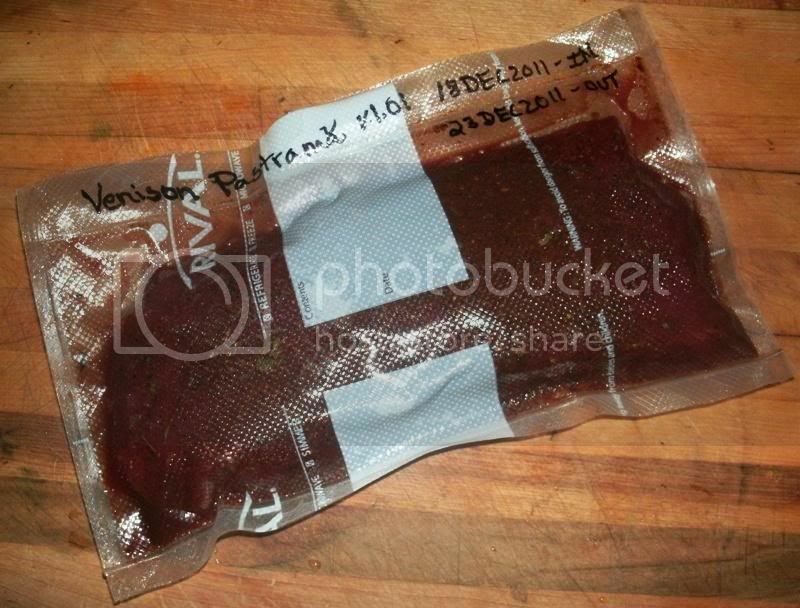 You can see that the curing process brought out quite a bit of moisture, and the venison has taken on a beautiful colour. We didn't have any ice, so I kept it in the refrigerator for the allotted time in order to keep the meat as cold as possible. And put it in the refrigerator overnight, uncovered, in order to form a pellicle, which is nothing more than a slightly dry, slightly tacky surface; the pellicle helps with smoke penetration and a better final product. The next day, I set up my Little Chief and began smoking the roast over alder wood chips, which I felt would be a great compliment to the venison. The Little Chief is perfect for projects like this, which call for cooler smoking temperatures rather than "smoke cooking." Smoking is optional, but highly recommended for a wonderful touch. Oak is the traditional smoking wood of choice for pastramă in Romania, but I didn't have any available. 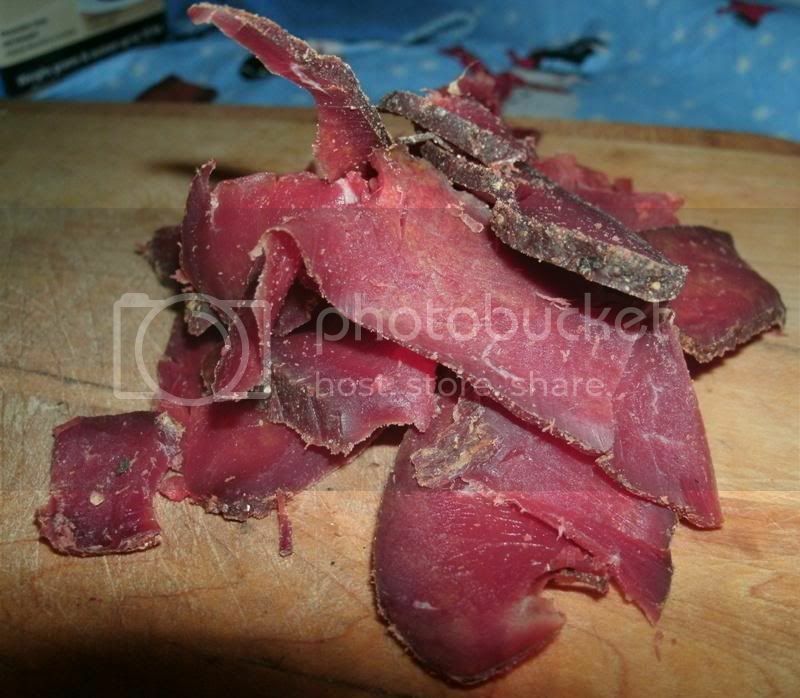 I found alder to be perfect for the venison, but that's no reason not to experiment. I imagine cherry, apple or maple would really be something, while hickory, pecan or mesquite would lend wonderful properties of their own. Your imagination is your only boundary. But not by much, and those extremes have been only during very brief times during a 24-hour period, so I decided to give the traditional method a try. I know from experience that the temperature of hanging meat tends to be pretty stable, especially this time of year, it seems. The slow curing results in a much more savory, tangy aroma and flavour, and I am hoping that comes across in the preparation. I am guessing this method would really have shown benefits earlier in the fall, with the sweet tang of leaves and grasses in the breeze; in fact, the famous Parma hams of Italy are renowned for the essence of the fresh mountain air they are cured in, as they hang in attics of country homes and barns. Unfortunately, it looks like our run of relatively mild temperatures is about to end, so I may end up finishing this in the oven after all - or, I might keep it in a cooler area such as our front porch, which has been blocked off for winter and should fall in the low range of the temperatures found in my research. If you choose, you can take the modern route and put the pastramă in your oven at it's lowest setting for a couple-three hours until the internal temperature is in the 145-degree range, then let it cool down naturally, package it, and keep it in the refrigerator or freezer. Having said that, the traditional, slow, air-cured method is, to me, the best path to the tastiest and most authentic results. The choice, of course, is yours. However, I am brand-spanking new to curing whole cuts of meat, and air-curing, so if anyone has any relevant advice or comments to pass along, I'd be grateful to learn. That's where we are for now - more to come. Alright, this project can officially be called a success, I think! If anyone follows this tutorial as well as the tweaks and suggestions in it, they should be able to have themselves a traditional Romanian specialty of the first order. After my previous post, where I hung the pastramă out in the open air to dry and cure, I left it there from Monday evening to Thursday evening, a total of about 3 days, or 72 hours. 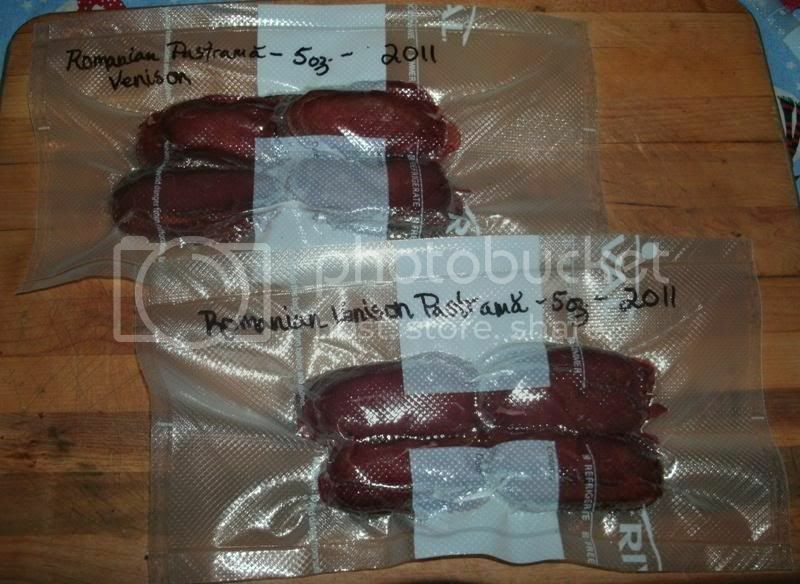 The different accounts I read for pastramă said gave different times for this, anywhere from 1 to 5 days; the Greek pastourma instructions advise 2 weeks - but that is in a cellar, rather than the wind, and also has a wet coating applied when it is hung to dry. With all this in mind, I took a middle-of-the road approach and chose 3 days - more on that later. 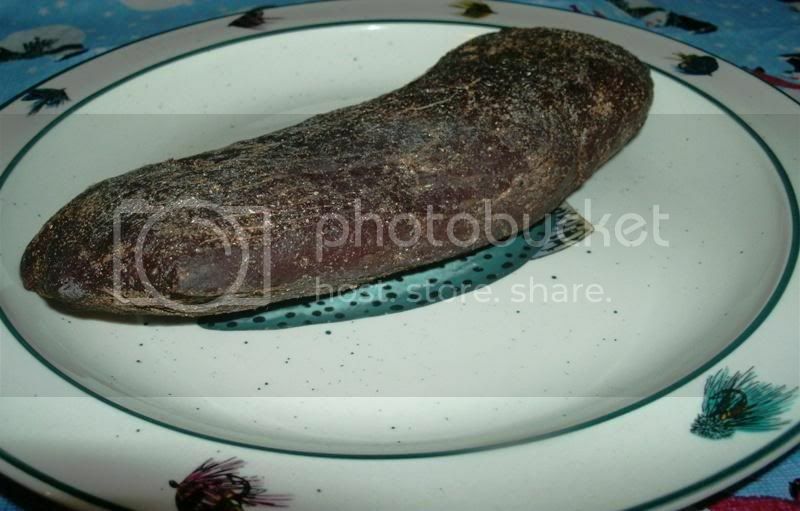 It doesn't look like much, just some dried-up meat, but it did have some interesting properties; chief among them was that it seemed to have "swelled" and had even gotten a little roundish in shape. When I squeezed it, it had some give, but no moisture oozed out, so I figured it was all good. The outside was dry and firm, and smelled like venison, so everything seemed just fine and as it should be. Just like the pictures I had seen ~ actually, this picture is a little lighter than it actually was - in truth it was rather dark in colour - a deep, beautiful hue, somewhere between crimson and burgundy, with the thin thread of fat lending a milky contrast. But even when squeezed and pressed with the tip of the knife, there was no oozing, so I put that worry aside and set up my slicer. So I put the other half in the freezer to firm up while I sliced the first half. I was able to get most of them very thin, but I am still learning with this slicer. One thing's for sure, the closer to frozen (without actually being frozen), the easier it is. Looking awfully nice, if you ask me! I did sample some, as I mentioned above, and passed a few around to the family, as well. 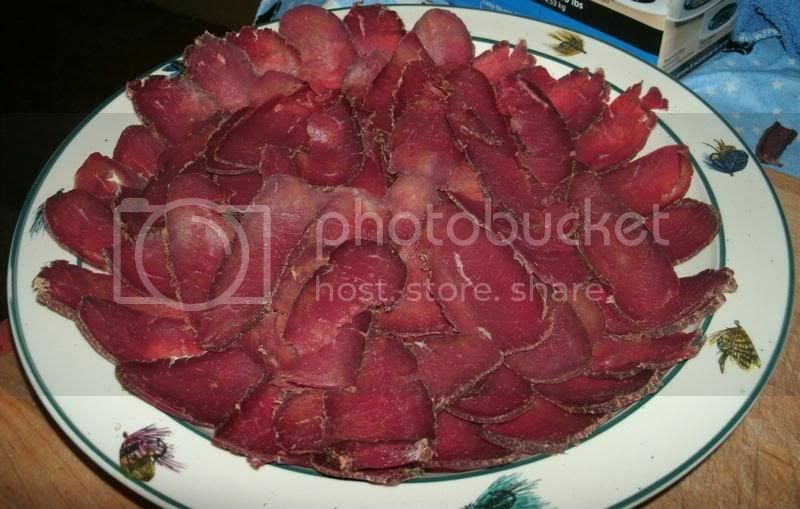 The beautiful Mrs. Tas didn't like it, which was expected; the pastramă is made from deer, and it is smoked - that's two strikes against it, as far as she was concerned. The kids seemed to all like it, and were hanging around hoping for more samples, but I had plans for the rest. 2) It is also "grilled," which in a lot of foreign countries means "pan-fried," sort of like bacon or ham - but can also mean grilled over a fire. An interesting personal experience was an invitation to dinner with a real Roumanian family (in Bucharest). What seemed to me a countless array of dishes containing most delectable dainties was arranged on a sideboard in the apartment where we were received. 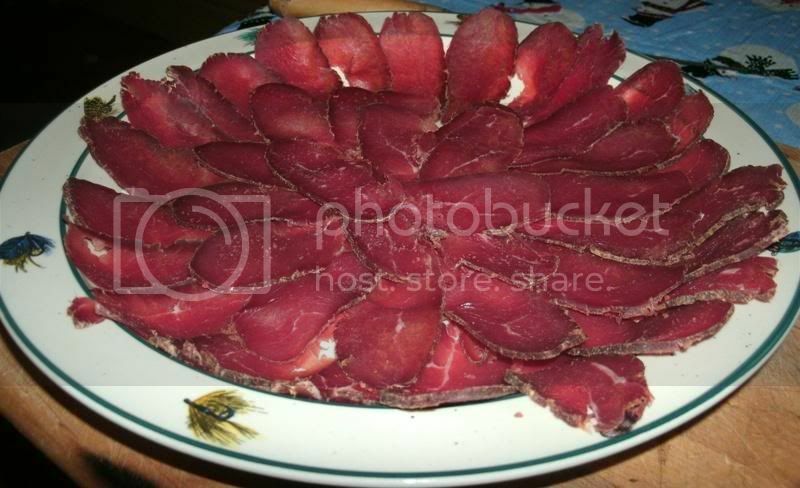 First came pastramă, small pieces of mutton grilled with zuika, a kind of native rum. 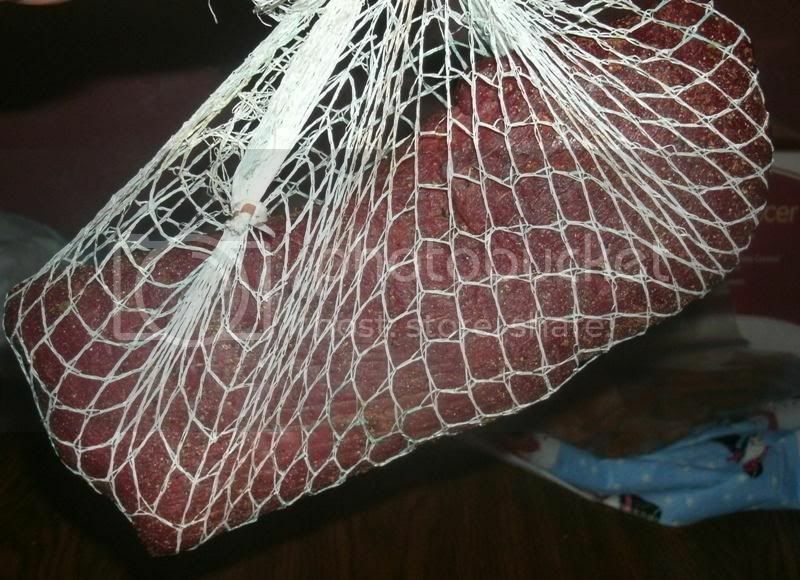 This pastramă has a marvelous flavor. But a person eating it for the first time cannot swallow it. He chews it and chews it like a piece of American gum, first in one cheek and then in the other, without knowing what to do with it. It is an embarrassing situation, because the pastramă is served in the reception room and you are expected to talk while you are eating it. I received my portion in an unguarded moment while conversing with an enchanting girl in a pompadour. Then we went into the dining room. That pretty much describes it right there, especially with the thicker pieces. The thinnest ones were a little different; they practically melted on the tongue as they released their flavour explosion really bringing out the savory goodness that must be experienced to be appreciated. 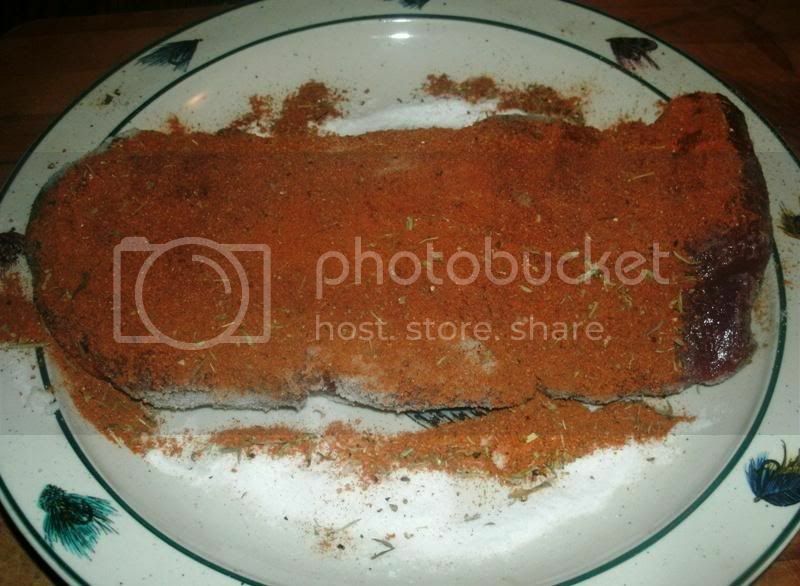 My only real complaint is that the herbs and spices (cinnamon, coriander, savory, paprika and allspice) didn't really come through as much as I wanted. 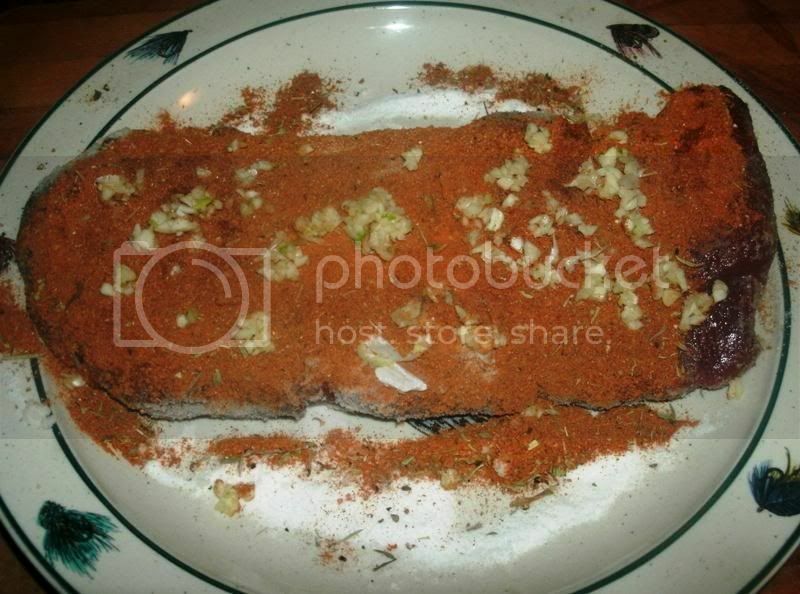 By adding them with the cure, I don't think they came through as well as they could have, except the garlic, which comes through really nicely and worked very well with the cure, the pepper and the smoke. Perhaps next time, I will double the amount of these other flavours and/or make a paste with them and slather them on the pastramă while air-curing. Speaking of the air-curing - as mentioned above, I hung it out in mild temperatures (no higher than about 54, no lower than 27) with plenty of good air-movement (well, to be truthful, it was downright windy for most of the time) for 3 nights and 2 days. It was perfectly fine this way - there was no "drippy" moisture at all inside, so it was all good, but I think it could have benefitted from a couple more days, just to develop its flavours and textures a little more. This is a hypothesis only, to be tested sometime in the future. And put them in the freezer. I looked around for some bread, dinner rolls, or even some crackers to try it with, but couldn't find any (it's the end of the pay period and there's nothing in the house - yay! 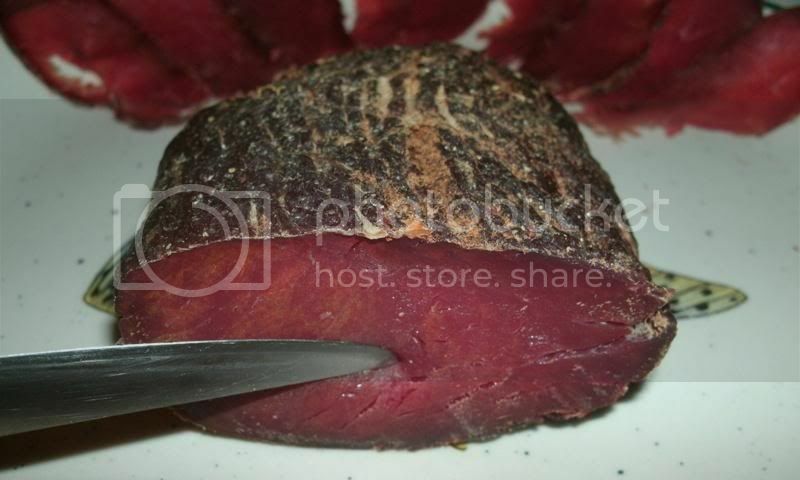 ), so I sampled the pastramă by itself and shared it with the boys. 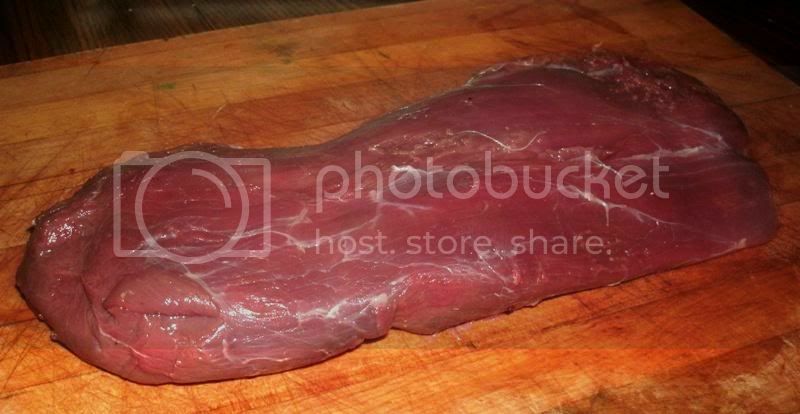 But I could easily see this as a great sandwich meat (when sliced thinly), or chopped fine and mixed with some vegetables, rice or potatoes as a side item, or sitting on top of a salad or next to some mashed potatoes. Heck, if a person wanted to dice or mince it and put it on ice cream, I think it might even be good - they do it with bacon nowadays, so why not? 1) For the first stage, I'll try curing it in natural salt, as described in much of my research. I'll read more on this in order to do it right, but it seems that this time-honoured method should be relatively free of complications. Hopefully this method will allow me (or YOU, if you try it!) 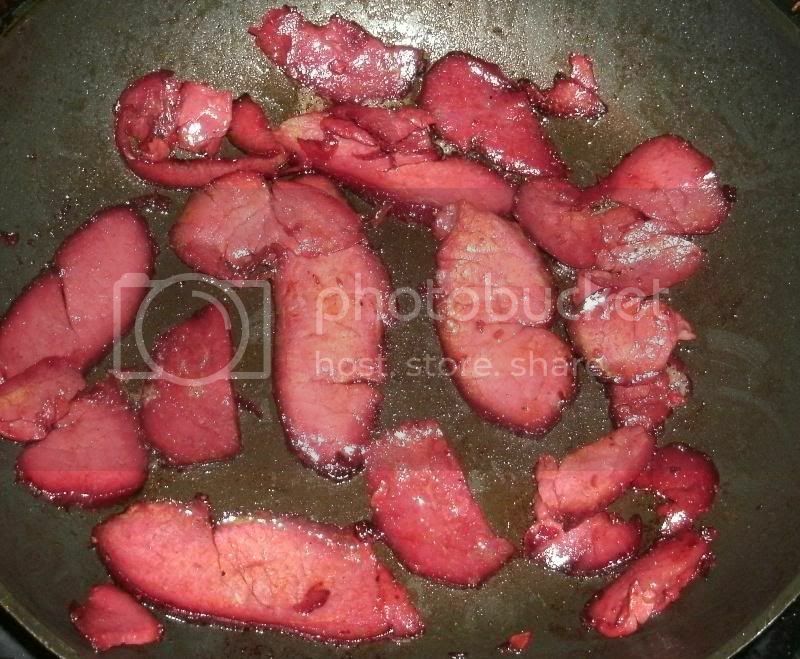 to get more of the awesome, exotic flavours through for an improvement - but even when made exactly as I did, pastramă is a very enjoyable, wonderful thing. WOW! 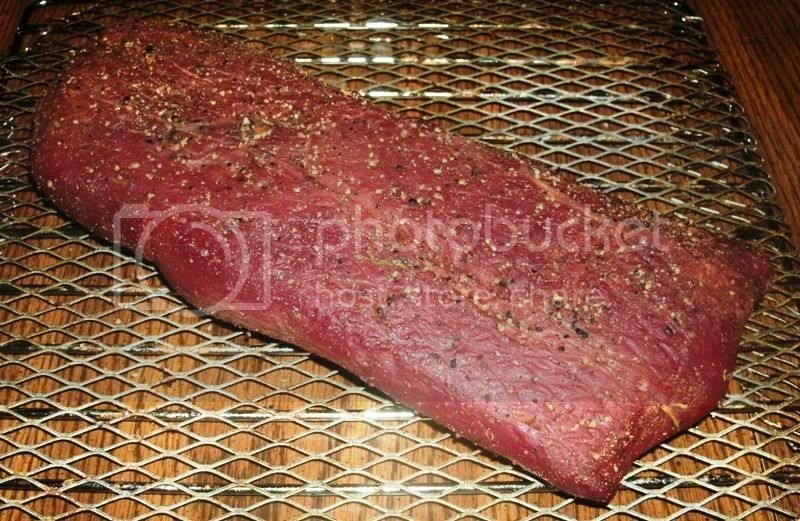 I stumbled on this thread while looking for a recipe for pastrami. Thanks for the discussion and the detailed explanation. 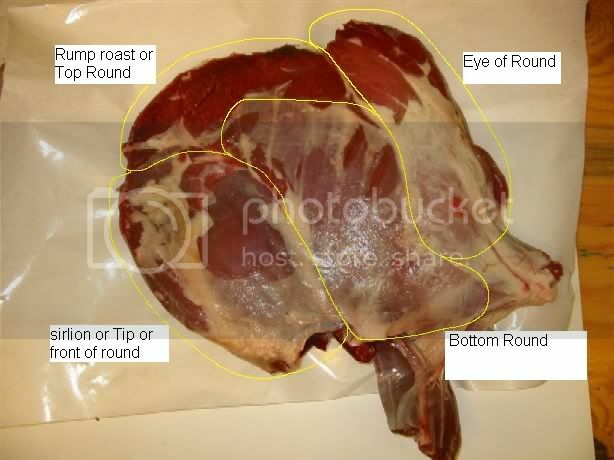 I'm going out RIGHT NOW to get a beef eye of round (all out of venison but it should work well enough), it looks absolutely fabulous. Fabulous ... truly wonderful work of art ... I have had wild boar done this way here in Spain ... wild boar sausage is absolutely phenomenal --- I was surprised I liked it ... I had venison tartar as well, and it was to awesome, at Madrid Fusion 2012 event which I had written about for the magazine. 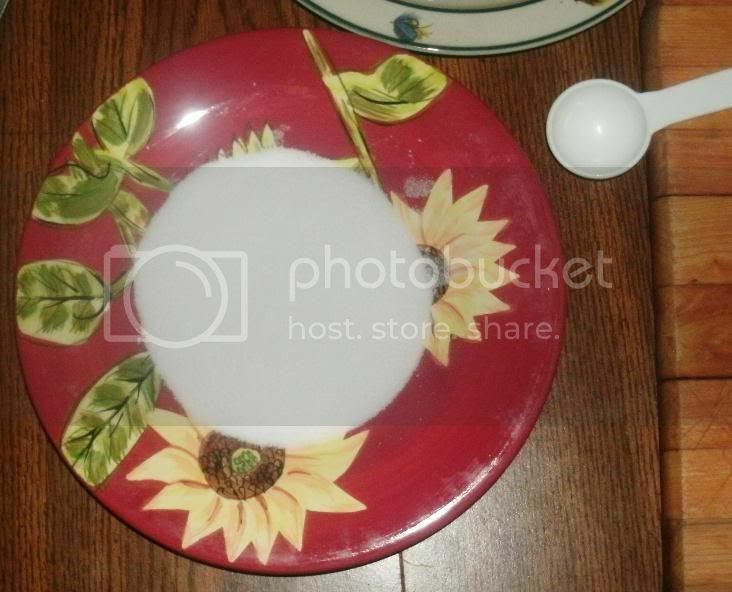 You are very professionally talented in the culinary arts. hi, chilehed - very glad to see you here, and i am humbled by your kind words for my project. this was the first time i had ever done anything like this, and i am glad to say that it turned out very well. i also learned quite a few things and can honestly say that i grew from the experience. 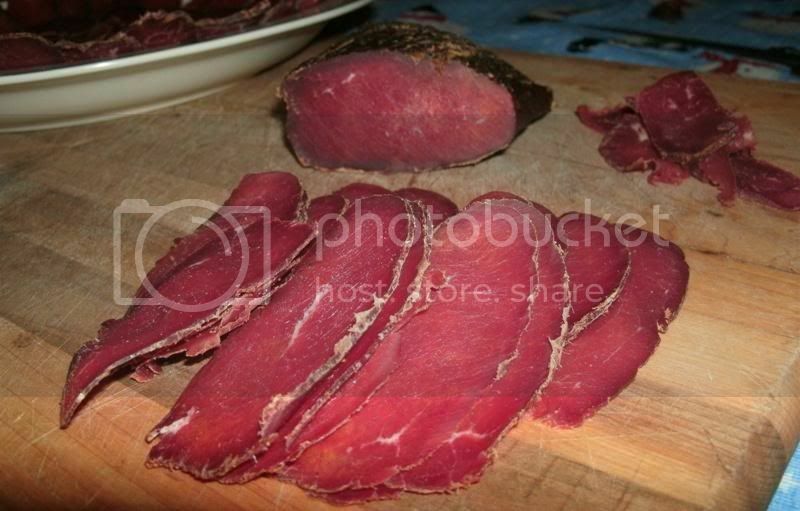 this romanian specialty is definitlly the grand-daddy of the pastrami we know and love today here in america, and i sncerely believe that anyone wishing to really understand pastrami should start here. it is on one hand entirely different, yet on another hand eerily similar. for me, it is the difference between simply looking at a clock and knowing how to tell time, versus also knowing how the clock works, all the intricate gears and settings....i think your plan to do this with eye of round is spot-on, and am looking forward to seeing results ~ please feel free to set up a post and let us know how it goes - also, if you have any questions at all, just ask! margi - thanks for your kind words as well! 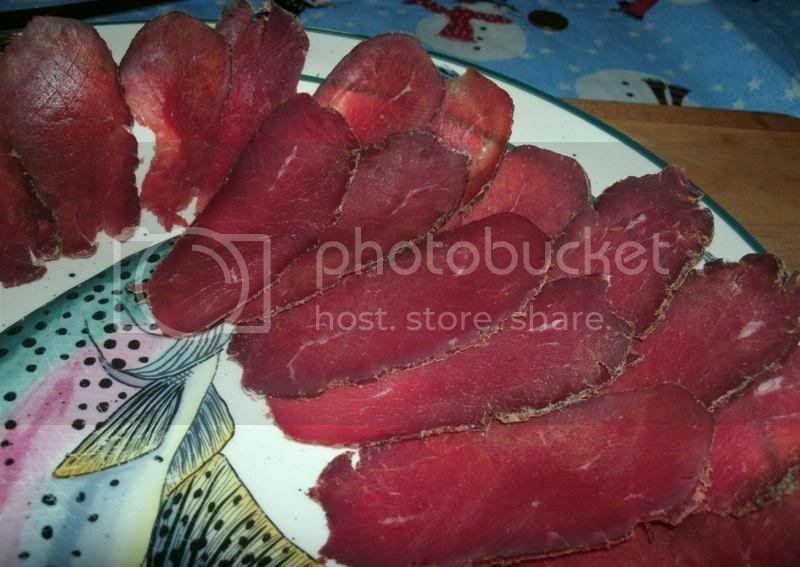 this preserved meat surely has similar counterparts in spain and italy. the basic process is similar to prosciutto or serrano hams or itlaian capicola - other similar products that are cured and then dry-aged for flavour. 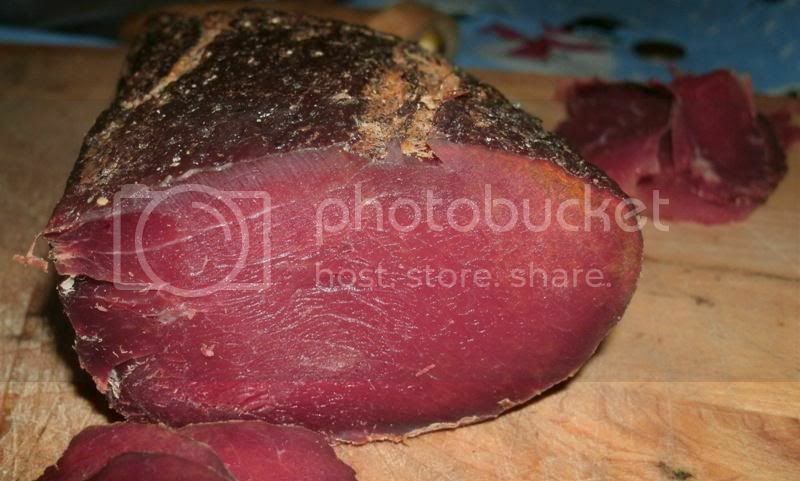 Serrano and Teruel Ham can be quite good too --- however, there is nothing like Jabugo BLACK FOOT ( PATA NEGRA ) HAM ... The province of Salamanca has been improving their Serrano ham production ... It can be quite tasty too depending on the quality. Teruel, as well, an Aragón province specialty. 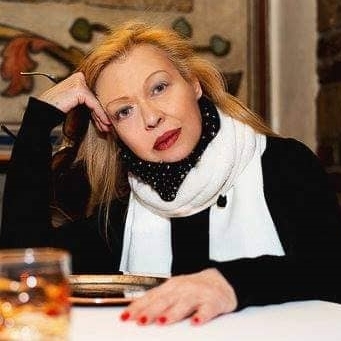 I am very open and like u, love learning something new all the time ... this is very interesting and I know a lovely Rumanian couple who live here and I shall enquire. yes, i would love to know their thoughts on this! please explain to them that i have never done this before, but tried to do it justice. if there are any really bad errors, i would like to know so that we can educate anyone who might be interested. i tried to be very detailed in my posts above, but if there is any clarification needed, please ask. So I shall let you know the results in March ... Could be interesting for the Magazine too ( not on line - had begun in 1958 as an expat publication for embassies, diplomats, ambassadors and business people --- ). hi, margi - that sounds great - looking forward to seeing how things go! :) also, congratulations on your new camera! if you need help getting a photobucket account set up, just ask dave or me. please pass along my regards to your romanian friends. i find the history, culture, and especially the cuisine to be interesting, unique and very much worth studying. Fantastic result, Ron! I would eat that cold as is, I'm sure it's excellent. Doesn't it taste too much of smoke when you fry it? I've eaten magret (duck breast) made like this but never venison. Sounds so delicious. One question though; what's "Tenderquick"? Looks like some sort of salt. hi, chris - this was excellent, when i tried it both cold and hot, i was greeted with two different-yet-equally-delicious results. there was some smoke aroma and taste that did become quite assertive during the cooking, but i gotta admit, i like those smells and flavours, so i didn't complain. having said that, smoking is optional with this, and a person can smoke as little or as much as they prefer, or not at all. if you ever want to try this product, let me know, and i am sure we can get some to you.